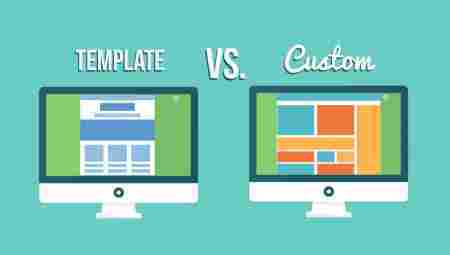 Custom Designs Vs. Template Design: Which One Gives The Right First Impression? Remember the cliché, “first impression is the best impression?” It’s not far from the truth! Your website is the first impression people have of your company and business, hence it should be remarkable, attention grabbing, and visually & logically appealing. Customers can make judgments one the companies and their capabilities to perform a task by simply having a look at their website. So, every business is bounded to creating a beautiful and modern website, which is user-friendly. A compelling website can be and addition to your lead conversion strategies too. An ugly, hard to use, or outdated website can turn your visitors down, compels them to leave the page and go to the website of your competitor. So, once you decide to rebuild the website of your business, you’d probably get confused on whether to use a custom design or a template design. If you are wondering about the right design path to boost the look of your business, then this article is for you! - Unique and Creative: A custom website design for your business allows you to show your audience the company culture and your business personality through unique design. The design you prefer to incorporate can be presented, revised and built into the custom template of the design. - More Flexible and Manageable: Custom website design is always synonymous with flexibility and expandability. Yep, when you have a small idea on how your website should be looking, they will mostly come up with a solution to make it happen. Custom features can be built to your site to make them more manageable and easy to use. Adding special features such as events, members’ only sections, portfolios, and testimonials shows your audience how cool your business is. - Advanced Code: If you are working with a leading development firm in your area, they will update themselves with the advanced codes and SEO techniques. This makes them easier to maximize the longevity of the websites they create. - Skilled Developers: Unlike template design, custom website designs can be handled only by skilled developers from a leading website development firm. These developers will usually be developers who are skilled in building a website from the scratch. Moreover, these people are rarely stumped by the challenge and are open to any changes, update, or development you require in the design further. - Expensive: Custom website designs are made according to the requirements of the business owner and the business needs. Hence, developing website using a custom design is more expensive compared to other websites that are developed using template design. - Time Consuming: To build a website from a custom design, the time required is between four to 12 weeks. Depending on the number of pages and size, the time can be longer. Since, the custom website design are responsive and easier to use, it can save more time in the future that you will spend on refurbishing your website. - Less Expensive: Custom website design is not for everyone. Yes, building a website from a custom design it requires a considerable amount of money. If you are a start-up or a small business, then it would be difficult for you to invest 50% of you profit on getting custom design for your website. So, if you want a website on a low budget, then template website design is the ultimate choice. Moreover, this would be suitable for people with less knowledge of how websites work and with a less understanding on the ins and outs of how domains and hosting work together. - Shorter Development Time: Since the web developers use a template they have built in house, it takes lesser time to develop. Also, the professionals will make sure that your template is up-to-date. Working with a professional is essential as it is a lot better than pulling a template off the internet. - Customization Limits: In a template design, the developer of a theme had a specific purpose for the theme and customizing it can be quite difficult. So, if you are looking for a website to just share your information about the company, then it is the perfect option. But, if you need it to talk to your audience or do cartwheels, sorry, this one is not for you. - Design Issues: When you decide on a template design for your website, you will get what you see. Most of the times, the layout is pretty set and you can only change the colors or font of the website. If you don’t have any issues with the layout, then the template could work in favor of you. But, remember, someone else out there may have the same website you have. - Requires Additional Software: If you are working with a template design to build your website, you may require additional software to customize, edit, and update it. Usage of additional software also demands you to understand coding principals, web building, and photo-editing. - Lack of SEO: Template designs for websites are not made with SEO in mind. So, if you are designing a website using template design, the site would always be lingering at the bottom of the search engine rankings. Other major issues associated with template website design are poor support and poor browser compatibility. - Customization Issues: When you intend to customize the template design of your website, you could not do it according to your needs. Most of the times, fitting web elements such as images, videos and texts is challenging with website templates. The author of this article is the leading web designer in New York with over a decade of experience in the industry. In this article, he talks about the type of website design you choose for your business. Visit https://ask8.com/ for more digital marketing ideas. Ask8 is a unique internet marketing firm. Where most Digital Agency NYC are lead by graphic artist or programmers, Ask8.com is lead by our CEO/Senior Business Consultant that has 25 years' experience in North East retail business industry as a senior manager. Combined that with 15 years in executing internet marketing services, you have a combination of business management insight with digital marketing talent that enables our clients to have the best of both worlds. 1. What Are The Most Crucial Questions To Ask An Seo Specialist? 2. Beginners Guide To Technical Seo - An Integral Part Of On-page Optimization. 7. Why Digital Marketing Services Are Essential For Real Estate Agents? 10. Why Investment In Seo Is A Great Business Decision? 12. How To Use Customer Reviews To Boost Local Search Seo? 13. Started A New Business? Look What You Need To Succeed! 14. Seo Link Building - How It Is Beneficial For The Popularity Of Any Website? 15. How To Promote Your Business On Facebook To Maximise Your Marketing Return On Investment?